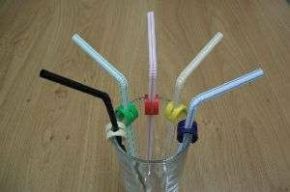 Strawberi Straw Holders Simple And Easy To Use. Like many of the best solutions, the Strawberi straw holder is simple and easy to use. It's a bright and attractive way of keeping a straw securely in place against a glass, tumbler, bottle or beaker. The award winning design has a slot that most common types of straw size will fit into. Reusable, easy to clean and dishwasher safe, the holders are available in packs of ten. Due to their size, not suitable for use with children under 3 years of age.